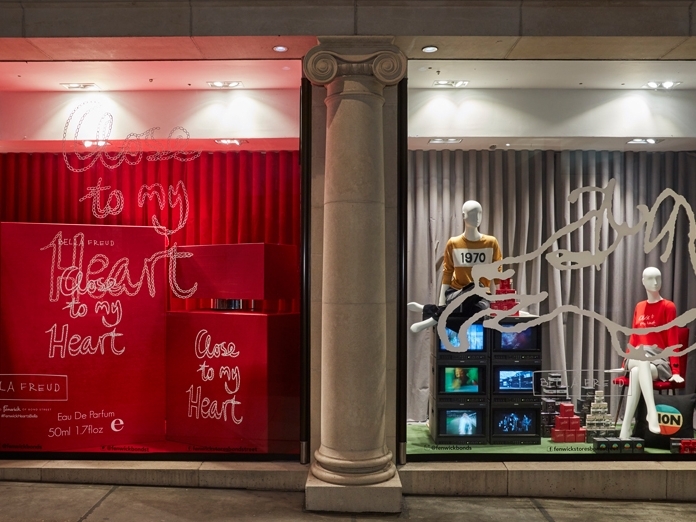 For the launch of the new Close To My Heart fragrance by London-based fashion designer Bella Freud, Propability created a scaled up replica of the perfumes tactile packaging to promote the exclusive pop-up at Fenwick. The bottle measuring 6 ft tall was created from MDF and sprayed in a high gloss to finish with mirror HIPS used as the bottle neck and a vinyl logo applied to replicate the original bottle. Together with this, the packaging for the bottle was also recreated to exact detail, with the giant box covered in fabric to match pantone reference. In addition Propability handled aspects of dressing including backdrops and the fabric for floors and walls to a second Bella Freud promotional window as well as a window vinyl.